Preview: Letter A Activities that would be perfect for preschool or kindergarten. Sensory, art, literacy and alphabet practice all rolled into Letter A fun. With my oldest starting kindergarten this year, it meant one on one time with my 3.5 year old. I decided to take the informal homeschool preschool approach with her just like I did with her sister. My plan this time, is to spend sometime focusing on each letter of the alphabet. We will still have thematic studies, but we are going to start with letters. We spent a week doing all sorts of letter A activities. Handwriting, art, literacy, sensory play and more were all included as we focused on the letter A. With this alphabet focus, my intent is to have my daughter recognize more of the letters of the alphabet. If she picks up on sounds along the way, then that is great, but my main goal is just to be able to identify the letters. Because my plan is to keep this informal and work around our schedule, I really have no set schedule beyond a letter each week. Some days we do two or three activities. Some days we just do one. 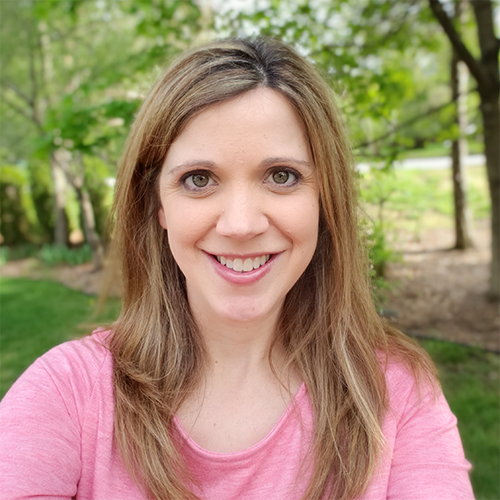 I kind of go with the flow and see how my daughter is doing and if she is ready for more or needs a break. Join us each week for some alphabet activity fun! To start our study of the letter A and a week of fun activities, we read the book Ten Apples Up on Top by Dr. Seuss. 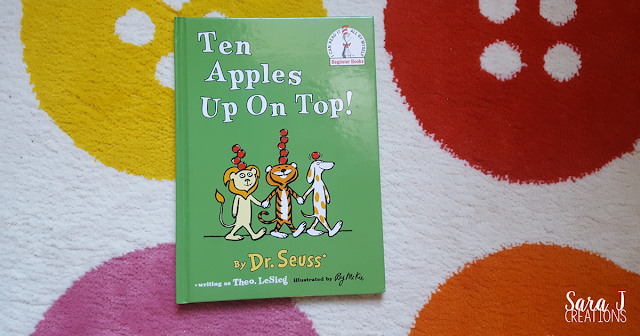 We talked about how the word apple starts with A. Then I showed her what an A looked like in the book and we searched for other A's. I made sure to pick a book that matched the picture that we would create next for our alphabet art book. I decided that as we studied each letter, we would complete a letter page using some different form of art. I bought a binder and we hole punched this sheet after the paint was dry to start making our alphabet book. 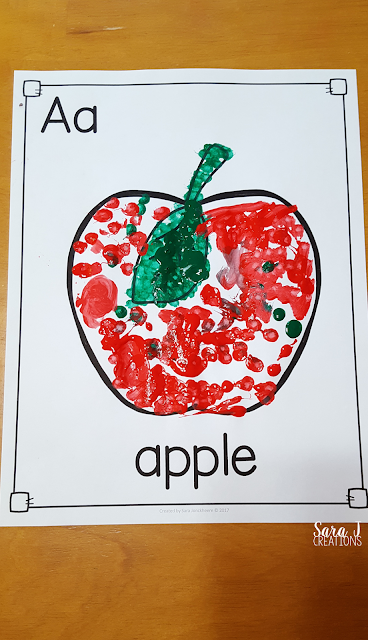 For the letter A, we used green and red paint and Q-tips to paint the apple with little tiny dots. I wanted the apple to be red with a green leaf, but my independent daughter had different ideas and wanted the apple to be red and green. To practice writing the letter A, I put our alphabet tracing sheets in a reusable plastic sleeve and gave her a dry erase marker. Because she is still young and I'm not expecting perfection, we didn't spend a ton of time on correct form. I showed her how to form the letter, let her trace it a few times and then try writing it on her own. Then we did the same thing for the lowercase a.
I also printed out my What's the Letter set and put the uppercase on one side in a page protector and put the lowercase on the back. She practice tracing the letters again and then had to identify and circle the letter. Then we talked about words that start with A. She knew right away that A was for apple. We did a few activities to practice finding the letter A in all different fonts - both upper and lower case. First, I grabbed our black roll paper (from the Target Dollar Spot) and wrote the letter A. Then I gave her a bunch of old scrapbook stickers and stickers that I've picked up at Target. I let her search through them and find the letter A and then stick it to the roll paper. We also practiced finding the letter A on our bingo markers sheet that is part of our Alphabet Centers with Real Pictures set. 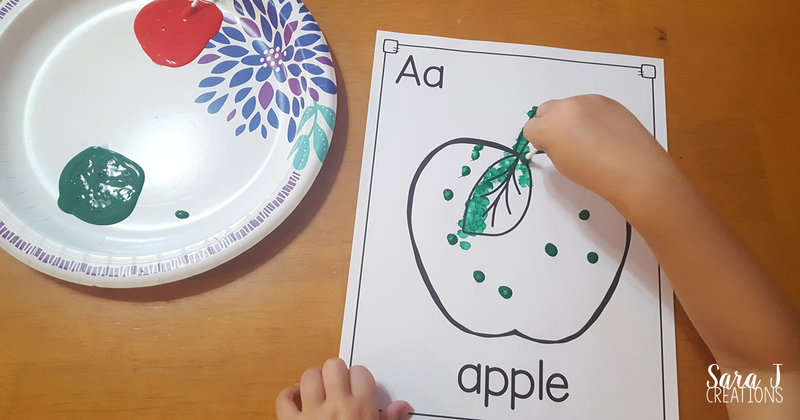 We grabbed some bingo dabbers (dot markers) and I let her dot the letter every time she found an upper or lowercase A.
I didn't take a lot of process pictures of this craft because I was helping my daughter with her apple, but it is a really easy craft. Depending on the size of your tissue paper, cut it down to long wide strips. The strip should be about as tall as the toilet paper roll and long enough to wrap around loosely several times. Glue the tissue paper to the toilet paper roll and then loosely wrap and continue gluing the tissue paper to itself until it creates an apple shape. There is no science or trick to this. If you want to scrunch it more you can, if you want to wrap it tighter or looser you can. Cut leaf shapes out of the green construction paper and glue to the top of the stem (toilet paper roll). To make an easy sensory bin, I grabbed the apples that we used last year in our 10 Apples Up on Top Activity. You can find them HERE on Amazon. Then I grabbed some fake leaves, mini apple erasers and caps from our applesauce pouches. Then I added some of the letter puzzles from our Alphabet Centers with Real Pictures. She had to dig through the bin and look for the letters. Then she had to match the upper and lowercase versions of the letters. This was still a little tricky with the letters we haven't focused on yet. We also talked about what in the bin starts with A. A is for Apple!! Looking to practice the alphabet in your classroom or at home? You can find our Alphabet Centers with Real Pictures that are featured above in my TpT store. Check out more letter activities!